Torrential rains overnight accompanied by winds lashed this district, trees uprooted affecting normal life. Many parts had power cuts and educational institutions were closed. The district administration requested people to stay indoors. Trains passing this district were canceled and some rescheduled said Southern Railway officials. Local administration personnel was employed to clear the uprooted trees. Rain with winds lashed Tirunelveli and Tuticorin, in Tamil Nadu. Fishermen stayed off the sea and the boats on the shore anchored also were damaged due to strong winds. The educational institutions remain closed in Tuticorin, Tirunelveli, Thanjavur and Viruthunagar. Kanyakumari district administration sounded a flood alert in rivers namely the Pazhayar, the Tamirabarani and the Valliyaru and these lashed various parts of the district. Normal life was out of gear owing to intermittent rain and heavy wind. Office goers and school children are subjected to hardship. Meanwhile, a man did trap in the high tidal wave. As per the sources Surendran 36 and his friend Subbu 22 of Rajakamangalam went to Therkurichi short to bath. As they were taking bath, Surendaran was washed away by a giant wave. The police and fire service personnel are searching based on his friends missing complaint lodged. People in low-lying areas were moved to safer places. The PWD officials were asked to keep poles and sandbags in adequate quantities to plug breaches. A flood-monitoring cell was also opened at the collectorate to monitor the situation. The flow of water into all four dams including Pechipparai, Perunchani, Chittar I and Chittar II was heavy. 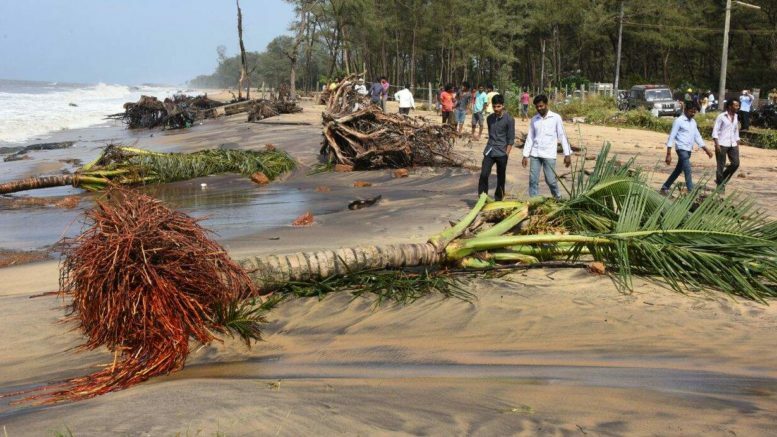 Many banana plants, coconut and rubber trees, were uprooted. Nearly 40 houses suffered damage in the coastal areas. Collector Sunil Paliwal, visited Vallavilai, the most affected area and directed officials to distribute a sum of Rs. 2,000, rice 5 kg, 3 liters of kerosene, saris and dhoti to affected persons. Be the first to comment on "Torrential Rains And Wind Slashes Kanyakumari District"